Food Costs > How Much Do Capers Cost? How Much Do Capers Cost? A caper is the pickled bud of the caper bush, also known as the Capparis Spinsoa. They are picked from a bush resembling a shrub, long before the bud even begins to form as a flower. Once picked, they will be dried out and brined or packed in a jar with salt. Oftentimes, it will mature to the size of an olive and will either be sold as a caper berry or it can be eaten like a pickle. The caper is an edible bud that can be used in various recipes, commonly used as a seasoning or garnish and is a dark olive green color, no bigger than a pit of an olive. On average, capers are going to come in 4, 16, or 32-ounce bottles. The cost can vary anywhere from $3 to $10 per bottle, depending on the size. Since capers can’t be harvested by a machine, each one has to be picked by hand, sorted by size and brined, leading to a higher price than most jarred ingredients. For example, a 32-ounce bottle of Bel Aria Nonpariel Capers can cost $9 to $12, while a 16-ounce bottle can cost $6 to $9. 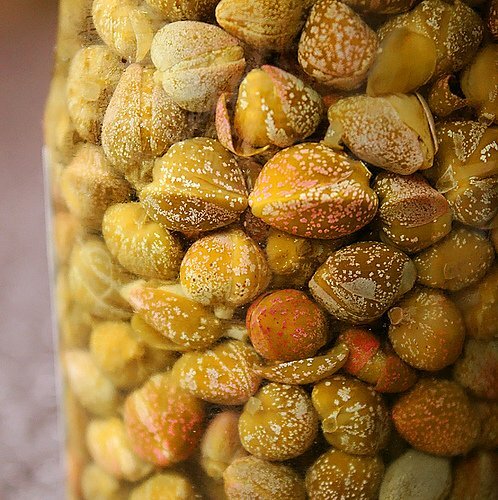 Organic capers soaked in sea salt can cost $5 to $13 per 3-ounce jar. TraderJoes365.blogspot.com says the price is $2.69. The blog also mentions they taste great in omelets and on top of salmon. What exactly are capers? Capers are small pea-sized green things, similar to an olive, that have a salty and vinegary taste to them. They are commonly found in Mediterranean dishes such as chicken piccata or spaghetti puttanesca and are known to offer a pungent, vinegary taste to anything its added to. People often add these items to any dish they want to add a saltier flavor to. Capers can often be purchased at any grocery store, such as Walmart, or online via gourmet grocery stores or even Amazon. In most stores, look for it in the Italian food section or next to the olives and pickles, usually in a glass jar. Capers are generally sun-dried and pickled in vinegar and salt. Some are flavored, while others are not. Shipping costs may incur if purchased online. Many retailers require a certain amount to be spent until free shipping is applied. Seasoned capers, which have additional flavors, will cost more than plain capers. The price difference may only be anywhere from $2 to $5 extra. Always make sure that you rinse and clean capers straight from the jar. This allows the capers to lose the excess salt from sitting in the jar. It’s recommended that you wash under warm water for at least 30 seconds to wash away the excess salt and brine. For those who are on a sodium restrictive diet, it is best to avoid this type of snack. Capers usually go great with foods such as salads, sauces, seafood, and pasta. They can also be consumed raw straight from the jar. There are many great recipes online, including the ever-popular, scalloppine. Since capers have so many uses, refer to this chowhound.com forum thread or this Huffington Post article for more ideas on what you can do with them. Most people find that once opened, they only use a fraction of the jar and don’t want to waste what’s left over. If you’re going to store capers, make sure that you have the right part of the plant. Many people tend to get confused with the buds of the plant which look like the capers. When storing, make sure that it’s stored in an airtight container. It can be kept in a room temperature area for up to six months. To get the most out of the capers in terms of flavor, try adding them at the end of the cooking process. Capers purchased online and in the grocery store are usually imported from countries such as France. The smallest size will be referred to as non pareil capers and this will be the most desired for recipes. Capers can be healthy for you if you want to increase your fiber intake, but due to the packaging process, the sodium content is a bit on the high side and should be avoided by those who either have high blood pressure or are at risk of heart disease. Naturally, these buds are low in calories. About three tablespoons will equal 10 to 15 calories, according to the United States Department of Agriculture National Nutrient Database for Standard Reference. Three tablespoons offer close to one gram of fiber, and according to dietary guidelines, adults need 14 grams for every 1,000 calories. On the downside, since capers are often stored in a brine, the sodium intake can be close to 250 milligrams per tablespoon. While sodium is required in your diet to help maintain fluid balance around in and around your cells, too much can often wreak havoc on your system, leading to high blood pressure and increasing your chances of heart disease. If possible, avoid more than 2,300 milligrams of sodium per day. Consider purchasing in bulk if you are going to use them in more than one meal. Bulk purchases are going to be a lot less per jar than buying individual jars. Organic jars are going to cost more than the non-organic. While there isn’t much of a difference, this comes down to a personal preference.